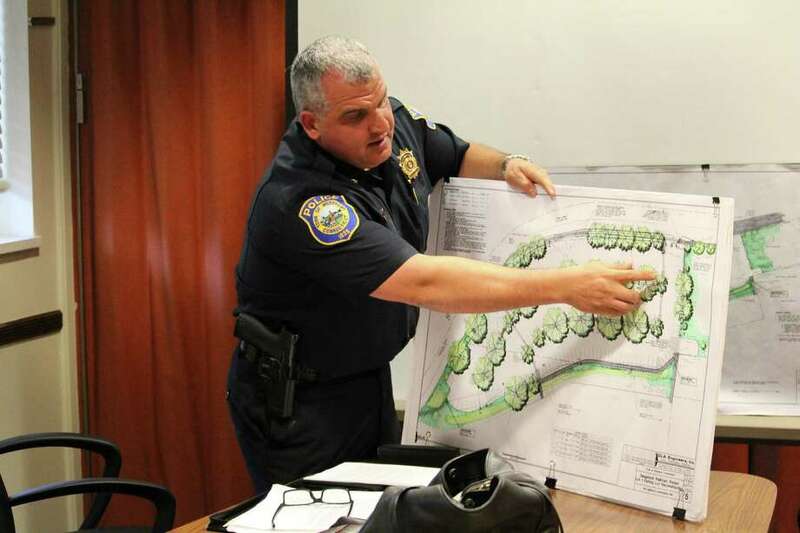 Police Chief Foti Koskinas explains to Kristan Hamlin, RTM District 4, the scope of the $1.5 million renovation to take place at Lot 1 of the Westport train station. WESTPORT — Prepare for a delay to your evening commute home Monday from Saugatuck. During the evening rush hour Monday all but one entrance/exit of the Saugatuck Train Station parking lot 1will be closed in order to simulate what reconstruction of parking will be like there when it begins. “I will be closing 4 out of the five entrances/exits in lot 1 tomorrow evening from 1730-1930Hrs (5:30 to 7:30 p.m) to simulate the best I can what the traffic pattern will be like coming out of lot 1 with one entrance/exit that is currently being proposed,” wrote Chief Foti Koskinas in an e-mail to the Westport News Sunday. Koskinas will also meet with commuters Monday morning to discuss possible parking changes at the Sagutuck Train Station. Koskinas will be at the train station from 6 to 8:30 a.m. Monday morning to meet face to face with commuters regarding concerns about the reconstruction of lot 1. “I am asking that anyone that chooses to come to lot 1 in the evening to observe the traffic pattern, park in lot #2 off of Railroad Place or on Franklin St. and walk into Luciano Park and observe from there. The goal is to not slow traffic down with our presence,” he said in the e-mail.